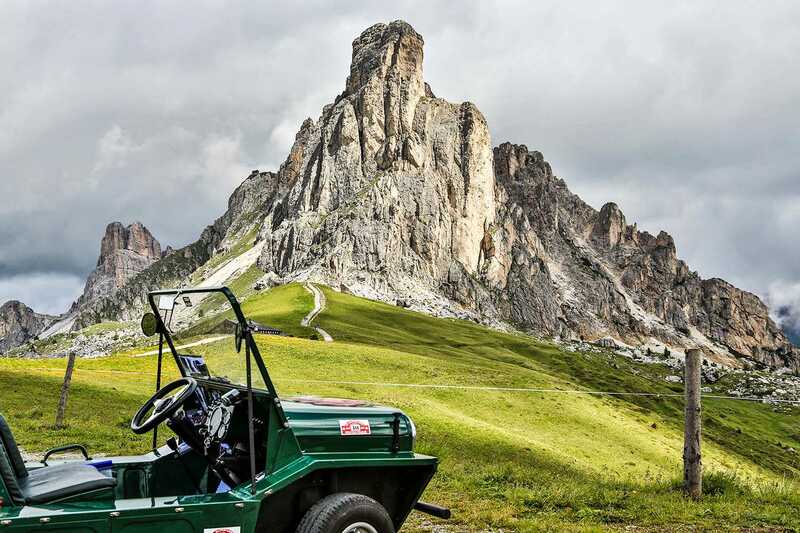 When you’re on a rally in a holiday spot, it pays to admire the countryside in peace and quiet from time to time – such as here at the Passo di Giau. Where it never gets dark. 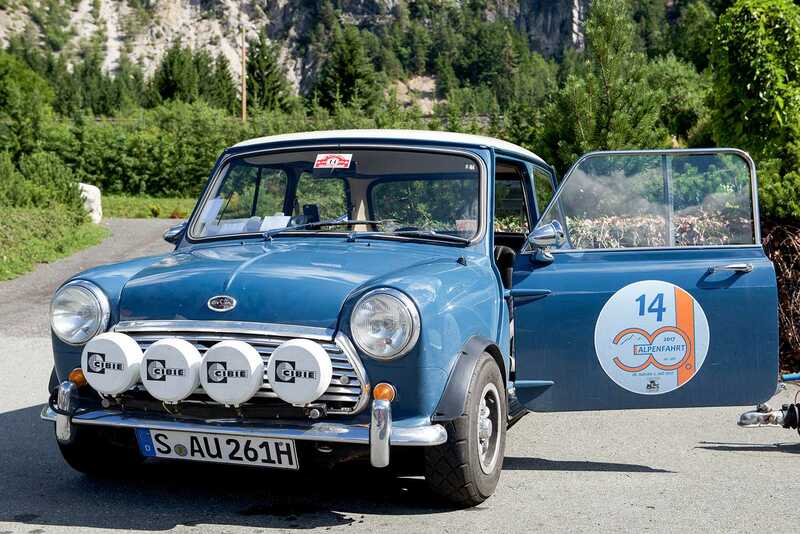 This classic Mini would also pass the kit test for the night stages of the Monte Carlo Rally. The 30th anniversary edition of the rally had its own logo, needless to say. Old and new hit the road together. The Mini community is not a place of dogmatically applied rules or segregation. Nobody gets left behind. Helping out a fellow “family member” is a matter of honour and, thanks to the presence of so many expert hands, mostly a quickly completed task. A special stage at altitude. Getting too distracted by the beautiful views can result in penalty points mounting up. The Mini Club München 1980 e.V. does everything you’d want of a car owners’ club. It’s a relaxed set-up, where people of all ages – with a shared passion for MINI – converge. Enjoyment is the name of the game, along with getting together and helping each other out when the need arises. Classic Minis and reborn MINIs are all equals here, although classic examples tend to garner somewhat more in the way of attention and TLC on account of their advancing years. Today the club has some 150 members. Small cars aiming high – the Mini Alpenfahrt. It’s a familiar story, the event that starts out small, turns out to be rather fun, soon gains a bigger following and then mushrooms in size. So the Mini Alpenfahrt has tracked some successful footprints, as the 30th anniversary edition of the rally showed. Over the years, it’s developed into quite the occasion. 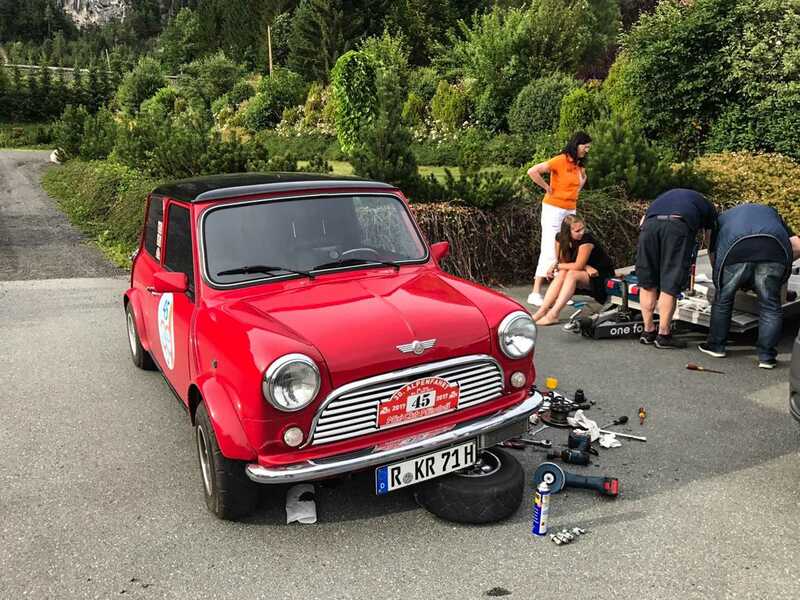 49 teams (a total of almost 100 participants) flocked to southern Germany for the start in 2017, placing their trust over the ensuing four days in a road-book whose level of detail genuinely astonished. Airy-fairy suggestions would not cut the mustard here; the whole shebang for an organised expedition of this nature, involving hotels, challenges along the way and route selection, demands some things are taken seriously. Such is the impressive result, it’s easy to forget this is all the product of the protagonists’ spare time. From Grasbrunn to the mountains. And so, on 28 June 2017 the starter’s flag in Grasbrunn near Munich did what it said on the tin, and the 30th Mini Alpenfahrt was underway. Off they went, the classic Minis and modern MINIs, gracing the most picturesque roads Bavaria has to offer on their way south. In keeping with the spirit of the rally, the teams encountered various challenges en route and carried a special card, which they were to fill in with the requisite numbers, letters and stamps. The cars even performed a parade through the pedestrian zone of Sterzing, in Italy’s South Tyrol, and were greeted in person by the executive of tourism association Sterzing (and a glass or two of bubbly). A very pleasurable Day 1 reached its conclusion at the Aktivhotel Panorama in Gossensass. Hotel director Harald Siller has a soft spot for the little Minis and used his contacts to assist with the organisation of the rally. The following day brought with it more go-kart feeling than even a MINI driver could claim to have at their disposal. Gathering at the top of the Ladurns chair lift, the participants climbed into ”mountain carts” for a hasty dash back down to the valley. Three wheels, no engine, an awful lot of gravity, plenty of steep slopes and stones spitting out this way and that made for a grin-filled experience. Then it was back into more familiar carriages for the 150 kilometres (90-odd miles) to Cortina D’Ampezzo. The destination on Day 3 was the Presseggersee lake near Hermagor – and the Alpenhotel Adria. The combination of wellness and beautiful scenery was tough to beat. 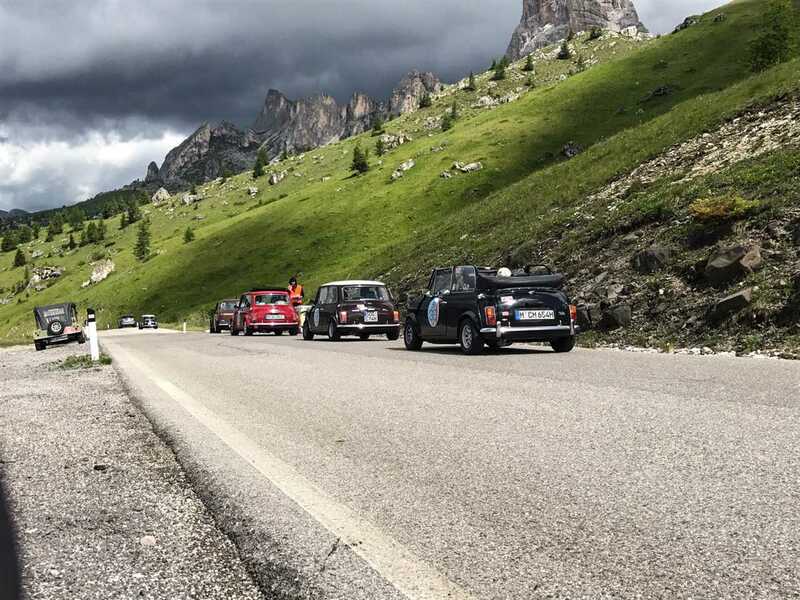 A particular highlight of the rally’s third day was a timed run over the Passo di Giau in which the teams had to keep to a precise average speed. Elsewhere, a picture search and question round kept the assembled minds occupied. Looping to the finish line. 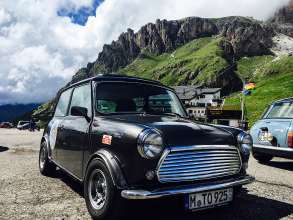 For the grand finale on the last day of the rally, a 130-kilometre (80-mile) round trip took the Minis and MINIs into Italy, along the Slovenian border and then south, via the Passo Promolo and Nassfeldpass. Before long, it was time for the presentation evening, which doubled up as a farewell party. The looks on many faces said it all: Eh? It’s over already? So it seems that 30 editions of the Mini Alpenfahrt rally are still not enough. The Minis and MINIs will be back for more in 2018 – it’s too much fun not to.